the Falconer in Central Park, a photo by Alida's Photos on Flickr. 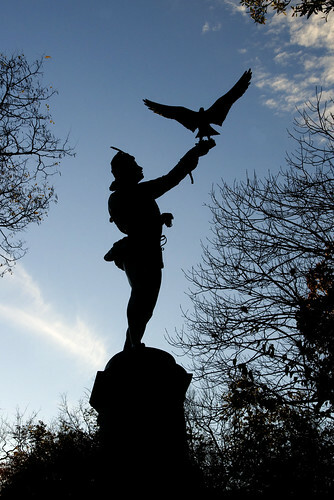 On the top of a large rock overlooking Terrace Drive or the 72nd Street Cutoff, is the dynamic bronze statue of The Falconer, one of the most spectacula statues of Central Park. The sport of falconry or the training of falcons and hawks to capture wild game or fowl is elegantly depicted by Simonds' masterful eye. Often unnoticed from the ground, is a figure of a young hunter dressed in an Elizabethan costume. His left arm is extended into the air while perched at the tip of his fingers is a large falcon spreading its wings in readiness for flight. To get a much better view of the statue one must climb the rock to observe its intensity.